Looking for something unique to wow her with this Christmas? Look no further than this dazzling necklace from Vanna K's Gelato Collection. This gorgeous Diamond & Peridot necklace will be a gift she'll love forever. 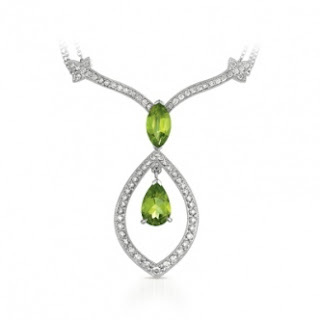 The two beautiful Peridot Gemstones (3 carats in total carat weight) flow into a dropped motif sparkling with diamonds, vintage and antique reminding us of the glamour of the renaissance era. Find more unique fashion jewelry gifts today at Vanna K.